Talking Points Regarding Savory | Planet-TECH Associates: Trends. Innovations. Opportunities. The evidence in support of Holistic Management, both scientific and empirical, combined with the heightened emergency of global warming, makes inquiry into this methodology essential. To ignore the merit and potential of this innovation now, or to succumb to vitriol, would be a dereliction of our duty as stewards of this planet. 1. Statements that Savory's work isn't supported in the academic peer-reviewed literature, or that it has been discredited in the academic literature are categorically wrong. The entire so called discrediting of Savory rests on two papers, Holecheck (2000) and Briske (2008), which themselves have been refuted in the academic and professional literature (Teague, Provenza, et al 2008; Teague, Dowhower, et al 2011, Gill 2009b, Gill 2009c). Studies in peer-reviewed academic literature show that Savory's method works in achieving a full suite of ecological, economic, and quality of life enhancing goals (Stinner, D. 1997, Teague R. 2011), including improved grass density, soil moisture, soil bulk density, standing crop biomass, and soil organic matter (SOM) (Teaque R. 2011) and percent volumetric-water content (%VWC) (Weber K.T., Gokhale B.S., 2011), where both SOM and %VWC are indicators of soil carbon. A recent study from Chiapas, Mexico has shown that Holistic Management on dairy farms allowed for an increasing in production with a simultaneous increase in sustainability (Alfaro-Arguello R., A.W. Diemont S., 2010). And Savory's thesis that a paucity of animals on grasslands is a major cause of desertification is also supported (Weber, K. T., Horst, S., 2011). 2. There is abundant empirical evidence of its efficacy (Dagget, D 2000, 2005; Judy, G 2008; Howell, J 2008, Savory Institute 2013, Planet-TECH 2013). 3. The climate crisis is much worse than is commonly realized and efforts of atmospheric carbon capture must become a worldwide priority. Recent research suggests summer polar cover could be entirely gone by as early as 2016 (Romm 2013), and that the resultant positive feedbacks from arctic methane release could cause runaway catastrophic warming, with "Permian Extinction" level consequences within this century (Arctic News 2013). Arctic News 2013. Global Extinction within one Human Lifetime as a Result of a Spreading Atmospheric Arctic Methane Heat wave and Surface Firestorm. http://arctic-news.blogspot.com/p/global-extinction-within-one-human.html. Misconception 1: Savoy has been discredited by peer review literature. False. The entire so called discrediting of Savory rests on two papers, Holecheck (2000) and Briske (2008), which themselves have been refuted in the academic literature (Teague, Provenza, et al 2008; Teague, Dowhower, et al 2011, Gill 2009b, Gill 2009c). The Holechek and Briske papers were synthesis reports of grazing management studies. The papers correctly stated, based on their review, that "rotational grazing" or "short duration grazing" systems don't have superior performance to continuous grazing. That was their whole finding, for which Savory or any practitioner of Holistic Management would concur. Their error, however, and the cause of this confusion, was in associating the studies cited with the Holistic Management approach advocated by Savory. This is a specific adaptive planning process geared for maximum ecological performance that incorporates goals and monitoring. Savory and others refer to this as planned grazing, or Holistic Planned Grazing (HPG). The distinction between that and what was studied by the papers in Briske and Holechek could not be more different, and the findings of one have no bearing on the other. “Grazing ungulates have an entirely different impact on the landscape than that implied by Briske et al. (2008), as is well documented by work at the landscape scale we have outlined earlier in this chapter. This points to an entirely different and more meaningful way of designing and interpreting grazing trials” (Teague et al., 2008). "Our study contradicts a recent review of rangeland grazing studies (Briske et al., 2008) which suggested MP grazing does not improve vegetation or animal production relative to continuous grazing. The discrepancy is because we measured the impacts on vegetation and soils achieved by ranchers managing at the ranch scale and adapting management in response to changing circumstances in order to achieve desirable outcomes" (Teague, et al 2011). "At the ranch scale, when multi-paddock grazing is managed to give the best vegetation and animal performance it is superior to continuous grazing regarding conservation and restoration of resources, provision of ecosystem goods and services, and ranch profitability" (Teague, et al 2011). As a result of the discussions on TED, Teague (2013) has reissued his refutation of the association of the Holechek and Briske findings with Savory. "The debate on MP grazing is not over. Reviews of grazing management research by Holechek et al. (2000) and Briske et al. (2008) concluded “multi-­‐paddock grazing improves neither vegetation nor animal production relative to single-­‐paddock continuous stocking.“ This hypothesis and viewpoint is deficient because it does not consider 1) critical differences between reductionist science and management, 2) the integration of ecological, economic, and social goals required for successful management, and 3) the value of case studies for studying such phenomena"
"To test this hypothesis, we compared ranches managed traditionally or with multi-­‐paddock grazing for at least 10 years. Our findings were consistent with the hypothesis that “at a ranch management scale, planned multi-­‐paddock grazing, when managed to give best vegetation and animal performance, has the potential to produce superior conservation and restoration outcomes for rangeland resources, to provide superior ecosystem services for society, and to yield greater ranch profitability and greater socio-­‐ecological resilience compared to season-­‐long continuous stocking.” This research is published in Teague et al. (2011)." Here is what Savory had to say about the distinction between planned grazing (his approach) and rotational or short duration grazing systems as early as 1983. (Planned grazing) is not a grazing system. Anyone describing it as a grazing system is merely indicating that he has not yet understood the holistic approach to the management of all resources simultaneously, with constant monitoring and adjustment to achieve a goal. Briske and Holechek would have known that Savory himself was outspoken about disavowing the types of grazing management systems that they were studying, and could have made that point clear. Here is Savory's response to Holechek's paper. "The work Holechek et al. describe is unlike any range man­agement practice I have ever advocated. They claim an ex­haustive research of the literature and refer to the first edition of my book. In my writings there is nothing advocating the short duration grazing they researched. In fact I have consis­tently stated that all grazing systems and rotations, including short duration grazing, will fail" (Savory 2000). The best refutation for the lay person, is from Chris Gill (2008, 2009a-c), a West Texas rancher. See citations below, particularly (2008). That is a point-by-point breakdown of Holechek. It is fascinating reading. Here is an example from Gill, in a letter to authors of the book Habitat Guidelines for Mule Deer which had claimed that Savory's thesis had been "disproved" citing, of course, Holechek and Briske. "Your conclusion has two parts: (1) planned grazing does not increase range productivity, and, (2) the increased hoof action of a large number of cattle associated with planned grazing consistently compacts soil and thereby decreases water infiltration (Heffelfinger et al. 2006). Both conclusions may be correct with respect to short duration grazing systems (SDG's). Neither is valid with respect to planned grazing. No study cited, or relied upon, tested the outcomes of planned grazing (Holechek et al. 2000)." Here are some additional summaries of supportive scholarly research. 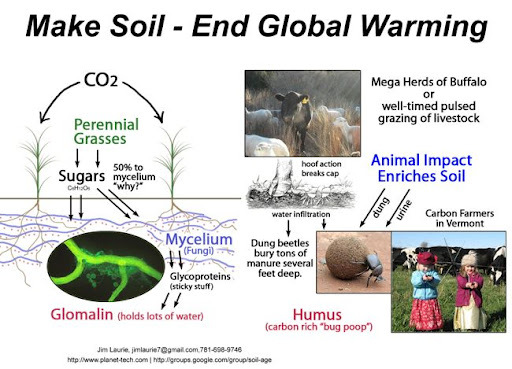 Concludes that multi-paddock grazing (MP) using "adaptive management" is superior to conventional continuous season-long grazing across a range of a ecological parameters, including grass density, soil moisture, soil bulk density, standing crop biomass, and soil organic matter (SOM) - which is a measure of soil carbon. Concluding statement: "At the ranch scale, when multi-paddock grazing is managed to give the best vegetation and animal performance it is superior to continuous grazing regarding conservation and restoration of resources, provision of ecosystem goods and services, and ranch profitability." Lack of biological decay (digestion) of grasses, leads to oxidation of grasses and desertification. Concluding statement: "In conclusion, the studies examined in this paper suggest “management systems” be reconsidered and supplanted by more inclusive planning processes focused on better managing the spatio-temporal aspects of grazing (animal impact and the duration of grazing periods) as one step toward improving rangeland ecosystems through the use of livestock as a solution to the problem of land degradation (Launchbaugh and Walker 2006; Wallace et al., 2008)"
Concludes that "simulated Holistic Planned Grazing (SHPG)" produces superior volumetric-water content (%VWC) when compared with other grazing schemes on similar soil. Concluding statement: "While a variety of factors influence soil-water content, holistic planned grazing appears to offer a management alternative with beneficial results measurable on the landscape. In light of these findings, additional studies are warranted relative to the merits of holistic planned grazing and the ability of grazing to favorably modify semiarid landscapes." Summary: Interview study of ranchers using Holistic Management. 95% report an increase in biodiversity, 80% reported an increase in profits, 91% reporting improvements in quality of life. All report that biodiversity is now an important consideration in managing their land, where only 9% felt so prior to exposure with Holistic Management. States that thinking about land management this way requires a “paradigm shift”. Summary: Study from Mexico showed that using Holistic Management productivity can be maintained while sustainability is increased - including reduction of burning and pesticides. Briske, D., Derner, J., Brown, J., Fuhlendorf, S., Teague, R., Gillen, B., Ash, A., Havstad, K., Willms, W., 2008. Benefits of Rotational Grazing on Rangelands: An Evaluation of the Experimental Evidence. Rangeland Ecology and Management 61, 3-17. Dagget, D. 2005. Gardeners of Eden: Rediscovering Our Importance to Nature, Thatcher Charitable Trust, Flagstaff, Arizona, (August 2005). Gill, C. 2009b. Doing What Works. Range Magazine. Fall. 2009. pp 48-50. Gill, C. 2009c. Of Mule Deers & Paradigms. In Practice. March / April 2009. pp 4 - 6. Holistic Management International, Albuquerque, NM. Holechek, J.L., Gomes, H., Molinar, F., Galt, D., Valdez, R., 2000. Short duration grazing, the facts in 1999. Rangelands 22:18-22. Howell, J 2008. For the Love of Land: Global Case Studies of Grazing in Nature's Image, BookSurge Publishing, Charleston, South Carolina. Judy, G 2008. Comeback Farms: Rejuvenating Soils, Pastures and Profits with Livestock Grazing Managemen, Green Park Press, Ridgeland, Miss. Savory, A. 2000. Letters to the Editor. Rangelands. June. 2000. 22(3). pp 32-33. Savory, A. 1983. The Savory Grazing Method or Holistic Resource Management. Rangelands 5:155-159. Savory Institute 2013, Research Case Studies and Project, http://www.savoryinstitute.com/research-and-case-studies. Accessed 3/21/13. Teague, W.R., Provenza, F.D., Norton, B.E., Steffens, T., Barnes, M.K., Kothmann, M.M., Roath, R.L., 2008. Benefits of Multi-Paddock Grazing Management on Rangelands: Limitations of Experimental Grazing Research and Knowledge Gaps. In: Schroder, H.G. (Ed. ), Grasslands: Ecology, Management and Restoration. Nova Science, New York, pp. 41-80. Teague, W.R., Dowhower, S.L., Baker, S.A., Haile, N., DeLaune, P.B., Conover, D.M., 2011. Grazing management impacts on vegetation, soil biota and soil chemical, physical and hydrological properties in tall grass prairie. Agriculture Ecosystems and Environment 141, 310-322. Written and compiled by Seth J. Itzkan, Planet-TECH Associates, www.planet-tech.com. March 2013.